← GMO Corn and Non-GMO Corn: Are They Nutritionally the Same? Eating at the same times every day trains the body to burn more calories between meals. Eat frequent, consistently sized meals to avoid binges and feel happier. Chemicals in pesticides can interfere with your body’s energy-burning process and make it harder to lose weight. There is a link between exposure to pesticides and thyroid problems. MSG, harmful fatty acids and toxic preservatives, sugars, refined carbohydrates, processed foods, and emulsifiers weaken the thyroid and may reduce metabolism up to 70% in the long-term. Both fluoride and chlorine in treated water supplies also interfere with normal thyroid function. If your thyroid is sluggish, your metabolism slows down and even becomes dysfunctional. Drink filtered water whenever possible. People who sleep less end up moving less the next day, which means they burn fewer calories. Also, sleep deprivation actually reduces the amount of energy your body uses at rest. Stay away from alcohol, fatty foods, coffee and chocolate at least 2 hours before bedtime. Common medications, including antacids, drugs for diabetes, cholesterol, and high blood pressure, all interfere with critical metabolic processes which dramatically reduce energy expenditure. When you skimp on calories, your body switches into starvation mode, slowing your metabolic rate to conserve the fuel it’s got. Always eat often and sensibly to match your energy requirements. Make sure protein is a component in every meal. It assists your body in maintaining lean muscle. Vitamin D is essential for preserving metabolism-revving muscle tissue. Exposing your full torso to the sun for at least 30 minutes is equivalent to approximately 10,000 IU. It takes only 20 minutes in any fixed position to inhibit your metabolism. 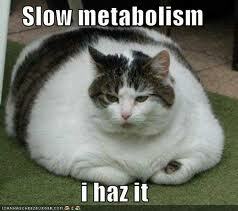 Your internal clock directly controls the part of your cells that keeps your metabolism moving along. But when you disrupt your circadian rhythm your cells don’t function the way they should and your metabolism suffers. All of your body’s cellular processes, including metabolism, depend on water. If you’re dehydrated, you could burn up to 2 percent fewer calories. When you miss breakfast, you don’t just set yourself up to overeat at lunch. You actually tell your body to conserve energy, which means it burns calories more slowly. This entry was posted in Weight Management. Bookmark the permalink.